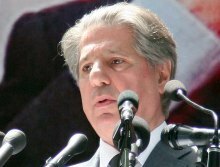 Former Lebanese president and current Phalange party leader Amin Gemayel told New TV on Sunday that Hezbollah is not a charity organization . His comment is a possible reference to the allocation of 7 ministers to the Sunnis instead of six . The purpose was to include Faisal karami son of the former PM Omar Karami , a staunch ally of Syria and Hezbollah. During a press conference in Tripoli Maan Karami, Omar Karami’s brother , said that the Karami family does not accept “charity” from anyone in Lebanon and is not honored for being represented by his nephew Youth and Sports Minister Faisal Karami. “We want to be an objective opposition, and we are not bound by March 14 General Secretariat’s statements when it threatens to organize street protests,” he added. Commenting on the absence of former PM Saad Hariri as a result of the threats against his life , Gemayel said: ” Every political leader’s life is threatened” adding that he expects Hariri to come back to Lebanon soon. The issue of the Special Tribunal for Lebanon (STL) continues to delay the drafting of the ministerial policy statement of the new cabinet and efforts to bridge the gap between Hezbollah and Prime minister Mikati have not been successful so far. The Special Tribunal for Lebanon (STL) an international tribunal was created for the prosecution of those responsible for former PM Rafik Hariri’s assassination . Hariri was assassinated on on February 14, 2005. The tribunal also has jurisdiction over a series of other attacks in Lebanon (between 1 October 2004 and 12 December 2005) if they are proven to be connected with the Hariri assassination. The court is based in Leidschendam, near The Hague, in the Netherlands and it has a field office in the Lebanese capital Beirut. the other secret behind hezbollah holding on to there arms is offset the palestinians arms ,which in case of a sunni shia,s war in lebanon the palestinians will side with the sunni,s beeing mostly of sunni,s faith, and ha is afraid that they will be overpowered by sunni-palestinians lebaneese alliance ; this is another motive for ha to keep there arms ,what the lebaneese should do is when they ask to disarm ha ,they should also demand to disarm all palestinians in lebanon ,that will make it easier for ha to accept and comply with the state demand. Yes … the only ‘arms’ should be with the Army of the Country of Lebanon.